It's that time of the year again. Time to bring our family and friends up to date on our vacations. And how we have traveled! After Dad had died, Eva expressed a wish to see China where we had lived. I checked on the internet for tours of China. Finally we found one that allowed us to add cities not on the normal itinerary. We added Qingdao where I had my eleventh birthday. So, on to China we went. Beijing (the capital city), Xian (the city of the terra cotta warriors), Guilin (down the Li River), Shanghai, and Qingdao. Beijing is everything that is said about it. Preparing for the Olympics, there was new building and repainting going on everywhere. Xian is not to be missed. The Li River is the free mountains of Chinese art, not some myths painted by artists high on something. Shanghai is huge, not to be seen in two days, like we tried. Qingdao is as I remembered it. Many beautiful houses and buildings. We found the house that we had lived in. The Grandson of the original owner was still living in an apartment in it. With the help of our tour guide and we had a long conversation. More at the end. We have top of the line rooms everywhere and good food, sometimes too much of it. Next I went to Illinois to straighten up my Grandfather's farm and to see a grand niece get married. Had a good time! Then in the fall, we went to Germany for a month. We rented an apartment in Eva's hometown. We used this to as a base to travel around Germany and surrounding countries. I have still not processed all the pictures. It is a good thing I went to digital camera! Now we are resting up and waiting for the next trip. 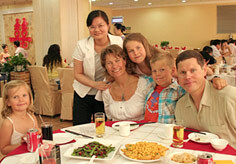 Our new Chinese friends the grandson and his wife, Li Chuangang and Sun Qing, want to visit us next March. Because they do not speak English, we have been busy learning Chinese. Two classes down already and maybe enough time for one more. My brain is getting too old. The Chinese spelling above is Merry Christmas and Happy New Year. From us to all of you!!! Everything was very good planned, very good food and hotel . The visits to the sights were good to do with the guides. We enjoy our duration in China and hope we have chance to go back again. Travel China Guide is a great way to explore China. All the staff are very knowledgable and they help you with every aspect of the tour. Efficient use of time with a relaxed attitude. Plenty of imperial experience of history with just enough urban bustle and shopping. Overall our China travel is very good. The hotel in Beijing (Holiday Inn Central Plaza) is excellent! It will be hard for the next hotels to live up to those standards. Our guide Lily was excellent. She made the trip very easy and very special for us. She went far beyond her responsibilities and even bought a present and a cake for my stepmother's birthday. We thoroughly enjoyed her. Our driver was excellent as well. He was always early and made good suggestions in heavy traffic. He was very friendly, very happy and spoke some English very funny. I'd highly recommend both of them to my friends. Xian is a wonderful city full of history. It is just amazing. The Terra-cotta Warriors was an amazing experience. I would recommend that all people travelling to China visit Xian. Our guide Lily was amazing! She was so knowledgable. She helped us find a beautiful local painting to bring home. She was very flexible with our schedule and allowed us plenty of time to see everything on our agenda, plus some extra sites. She was very kind and made sure we enjoyed our trip. Our entire China trip was wonderful. 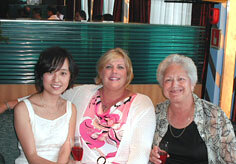 Our guide in Shanghai was also very knowledagable and agreeable and made our stay in Shanghai very special. 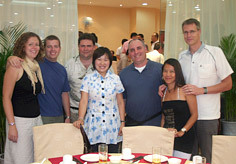 We will recommend Travel China Guide to our friends. Tour was well-organized and well-paced. The right amount of activities each day as well as a good amout of time for each activities. Our guide wes very knowledgable and friendly. She was very considerate of our well beijing. Our driver's skill were most impressive. We had a good time in China.